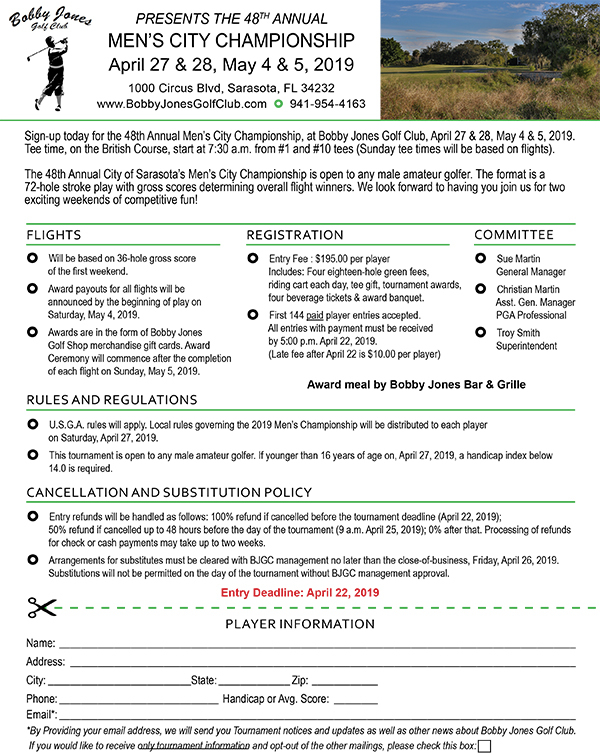 Sign-up today for the 48th Annual Men’s City Championship, at Bobby Jones Golf Club, April 27 & 28, May 4 & 5, 2019. Tee time, on the British Course, start at 7:30 a.m. from #1 and #10 tees (Sunday tee times will be based on flights). exciting weekends of competitive fun! of each flight on Sunday, May 5, 2019.
four beverage tickets & award banquet.  First 144 paid player entries accepted. by 5:00 p.m. April 22, 2019.
for check or cash payments may take up to two weeks.  Arrangements for substitutes must be cleared with BJGC management no later than the close-of-business, Friday, April 26, 2019. Substitutions will not be permitted on the day of the tournament without BJGC management approval. *By Providing your email address, we will send you Tournament notices and updates as well as other news about Bobby Jones Golf Club.